I used store-bought sliced carrots, and I cooked my bacon in the oven. It’s really an easy recipe, once you have all the ingredients. Just assemble everything together and mix it with the dressing! 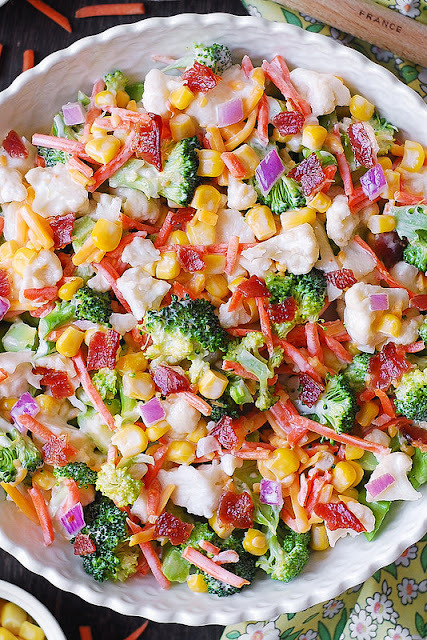 In a large bowl, combine together all salad ingredients. Use one of the two salad dressing recipes provided. In a medium bowl, combine mayo and sour cream (or kefir or Greek yogurt) and add 1 or 2 tablespoons of dry Ranch mix. Mix well and taste to see if you need to add more dry Ranch mix to the dressing. Gradually add the salad dressing of your choice to the large bowl with the salad ingredients, and stir everything together.